I started a German class last week. It is…gut! (Haha, gut is a German word.) I have missed being in school so, so much. I haven’t taken an actual class since I took a few writing courses at NYU during my first year out of college. Since moving out of my parents’ house, I hadn’t been able to afford any adult education classes. However, now I’m able to be a little bit more self-indulgent with my dollars and I figured that I should start up with German again sooner rather than later. I took German for fun during my senior year of college. It’s honestly not something I would have imagined myself doing, even though I have been a student of German history as long as I can remember. Seriously, I feel like half of the classes I took in college were either about German history or in the German department. I started taking German because I went to Berlin for a weekend while I was studying abroad in Paris for a semester. 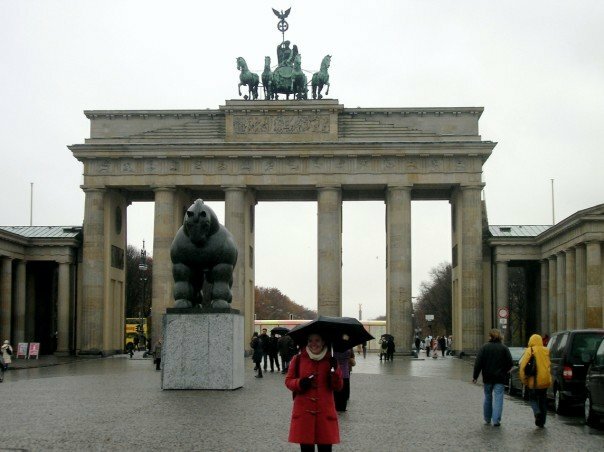 Berlin was on the top of my list of places I wanted to visit, but I didn’t know how obsessed I would be until I got there. I’ll probably talk a little bit more about this trip in my next post about Paris, so I won’t say too much now. But I will say that Berlin is one of the few cities I’ve ever visited where I truly felt like I could live there. I loved the German class I was in during my senior year. It had been so long since I had been a beginner in a language. (I started taking Latin at age 12 and French at age 14). It was fun learning all of the basics. Plus, I was good at it. Before I knew it, though, I was graduating. And there would be no more German for me until after college when I briefly dated someone who was moving to Germany and liked to speak what I felt were complicated sentences in German at me, which made me kind of nervous. I had planned on visiting him in Germany and had wanted to resume my German studies before then, but…our communication ended shortly after he got there. And for a while, I wanted nothing to do with Germany or the German language. But, eventually, I started to get the itch to learn something again. I knew I wanted to try to learn a new language, but it seemed a shame to start something entirely from the beginning. I shopped around – on the internet – for language classes in the city and settled on taking something with Fluent City. They’re based in Williamburg, not very far from where I live, so it’s the most convenient. (They also offer classes in Manhattan and in other locations around the country.) And frankly, it just seemed like the coolest language school. But I’m looking forward to being challenged in a way that I haven’t been in a long time. Learning to speak a new language is hard. I’ve always been good at memorization and translation. Speaking, especially when it’s not in a social context and I stand the chance of being embarrassed, has always been hard for me. I’m trying my best this time around to be willing to make mistakes and look stupid for the sake of learning, Hopefully, it will work. And then I can realize my dream of moving to Berlin, where everyone will speak English to me after they figure out that I’m not a native German speaker.